Slow cooker Hawaiian Kielbasa Bites are the perfect appetizer for game day or holiday potluck. 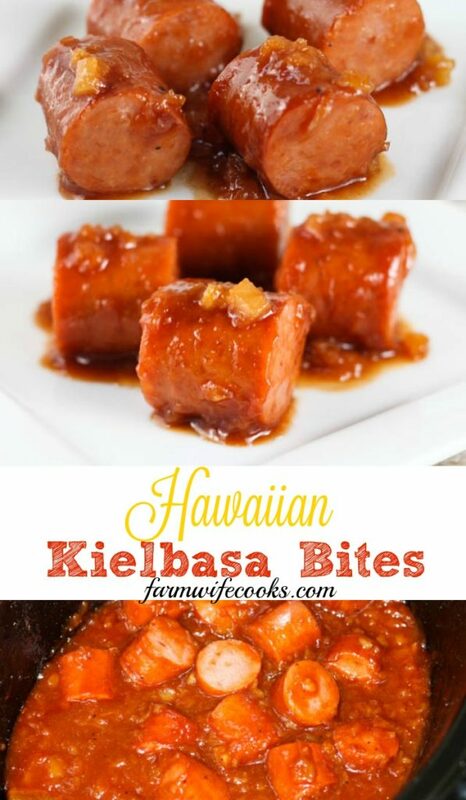 An easy recipe made with Kielbasa sausage, pineapple, BBQ sauce, brown sugar and spices. This recipe was adapted from a recipe in the Gooseberry Patch 303 Simple & Satisfying Recipes cookbook. 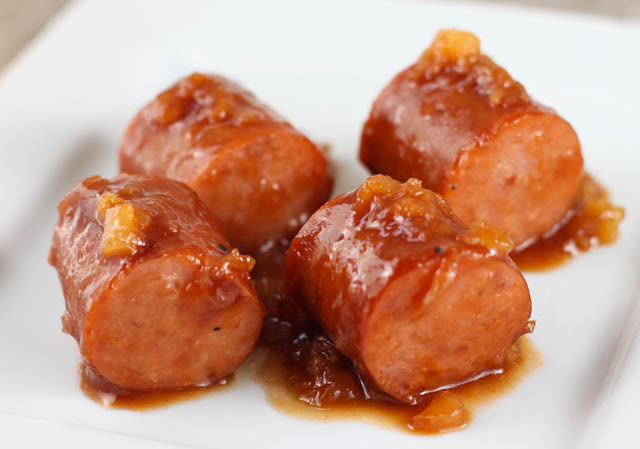 If you like this recipe you might also like this Crock Pot Sweet and Sour Smoked Sausage and if you are looking for more game day grub ideas check out this post 11 Winning Game Day Recipes. If you aren’t familiar with Kielbasa (Polish Sausage) it is a type of sausage that is traditionally made from pork where as Smoked Sausage can be made with a combination of different meats. 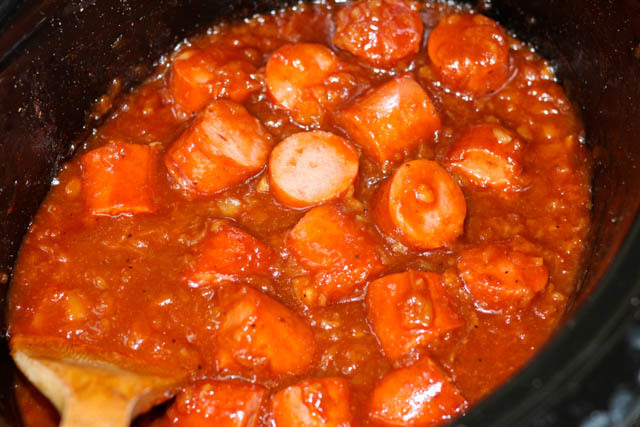 This recipe is simple to make, just cut up the Kielbasa in desired length, add remaining ingredients and mix together and then cook until heated through. The original recipe called for 2 inch pieces but I thought that was a little big and went with one inch pieces instead. You could also cut them into thinner slices. I used Sweet Baby Rays BBQ Sauce but you can use the kind your family likes. 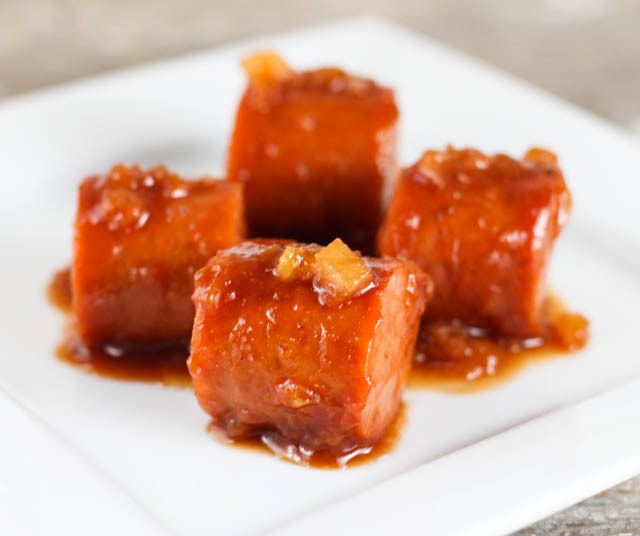 This recipe is one of those I would recommend using a slow cooker liner, as the sauce gets sticky as it cools and makes the crock pot hard to clean. 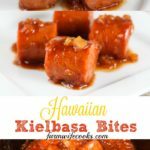 Hawaiian Kielbasa Bites make a great appetizer but would also be great for a meal served over rice. Cover and cook on low setting for about 2 hours until warmed through or on high setting for about 30 minutes.